James Kelly: You grew up as part of a generation that followed on from the likes of Pablo Neruda, José Donoso, Manuel Rojas, and Carlos Droguett. Can you tell me about the literary scene in Chile at the time and how this influenced your formation as a writer? We were voracious readers, all the way from the classics right through to the appearance of José Agustín in Mexico. However, in those years, the air was thick with the cadence, the fresh breath of Neruda’s poetry. There were the adobe tenements of Alberto Romero, with rooms that housed entire families, and the day labourers of Manuel Rojas, forever on their feet. There was the Independencia district of Fernando Alegría, José Santos González Vera’s story “Maruri Esquina Cruz,” and Carlos Droguett’s famous bandit “Eloy,” who would come down to the city from his mountain safe houses, the police hot on his trail, appearing unannounced among the blind alleys of the Franklin district. And, of course, there were also the victims of the Seguro Obrero massacre, in which a group of students was taken from the central campus of the University of Chile and shot dead on the steps of what is now the Ministry of Justice in the Plaza de la Constitución. This was the backdrop against which I grew up, a sort of ever-present music that demanded respect and creative rigour. In those days, publishing a book was serious business, not like now. JK: This was also around the time when Chilean literature was starting to open up to new influences. Can you tell me a little about that? RR: Yes, when Nicanor Parra burst on the scene with his anti-poetry, he ushered in the end of a canon that was no longer able to satisfy the restless readers of those times, exposed to the work of Ezra Pound and T.S. 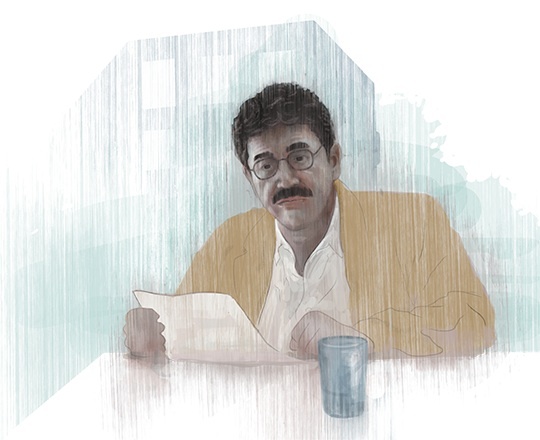 Eliot, so dear to the poet César Soto, who taught us how to read their writing, and other poets such as William Carlos Williams, Allen Ginsberg, and Ray Durem. Curiously, José Donoso, whom you mentioned earlier, is something of an outsider. As much as people were talking about his novel The Obscene Bird of the Night, to paraphrase the poet Jorge Etcheverry, the bird’s time to sing was yet to come: at that point the work failed to strike a chord, to capture the sensibility of Chile at the time, and it wasn’t until my time spent abroad that I connected with his work. Instead we recited Pezoa Véliz’s poem “Afternoon in the Hospital,” and “The Black Heralds” and “Black Stone on a White Stone” by César Vallejo (it might even have been on a Thursday), in spite of the fact that we were already reading the work of Faulkner, Hemingway and Fitzgerald, Salinger and Kerouac, Dylan Thomas, Sartre, Camus, and Simone de Beauvoir with something more than fervour. Yet in spite of all this, at the end of the fiesta, I could feel that creole melancholy tugging at me, the sound of tangos, waltzes, and marineras. JK: Your novel, like some of your earlier work, is written in a prose style that is rich in allusions and wordplays and would seem to owe much to experimental traditions of the twentieth century, the second half of which was a tremendously productive time for Latin American literature, not least during the years of the Boom. What influence, if any, did this context have on your prose? RR: The idea of play, the numinous experience of playing with words, might perhaps in part have its origins in my readings of Nicanor Parra and the Cuban writer Guillermo Cabrera Infante. The truth is I have always been an avid reader of poetry and I am familiar with the work of a great number of poets. Yet I also had to find a literary voice of my own, and why not drink from the experimental fount of the twentieth century. That said, no one from my generation could escape the Boom, and to my mind there is no doubt my novel bears the hallmark of the “totalising” work of the period. Yet it finds its escape from this harness through the grotesque. For me, the novel is bound by kinship to the Middle Ages, to Bosch and Bruegel, to the imaginary of Rabelais. There are so many dialogues in the novel, it maintains various interwoven dialogues. That’s also the challenge: which discourses? which works? which memories? JK: Another aspect of your work suggested by the presence of allusions and wordplays would appear to be the role played by the reader. Your writing seems to demand that readers play a very active role in the creation of meaning. RR: Without a doubt, I demand a lot of my readers, perhaps even too much for the banality and superficiality of the times in which we live. That said, this dialogue, even if it requires the reader to play a more active role, is also much deeper. Perhaps we can close the book and sit in the darkness meditating on an image, a wordplay, behind which another always lies in wait. I’m talking here about that sense of mirrors, of doubles and triples, and so on… readings of reality, certainties that are diluted in more certainties and… in fact lead to more doubts and searching, a consciousness that houses another, deeper consciousness within it, and when you get there, another is waiting, and all of this leads us to the inevitable conclusion that we have a magnificent set of teeth, that is, in spite of our consciousness, in spite of being able to raise animals with love and affection, we remain ferocious mammals, able to devour them with pleasure and delight. JK: Prior to your novel, you published a collection of short stories entitled La pradera ortopédica (literally The Orthopaedic Meadow), which included the short story “Malagueña” (translated as “Malagueña”). The character from this story, Flaco, went on to form the basis of the main character of your novel. There are also other connections between the works, such as the concept of the meadow and the presence of the minotaur, both of which figure prominently in your novel. RR: Both works form part of a project based around the character of young “Flaco” Nicomedes, a sort of artist and intellectual from the margins of society. He’s a character with his own life, who stepped out from the page and demanded his own presence. The character left hanging in the short story in the collection you mentioned took hold of me and began to grow, repeatedly showing me that never again, that the space he finds in fiction is lost forever with the military coup in the real world; never again, or at least things will never be the same again, because all of a sudden people like “Tío Roberto” Parra, a famous busker who used to sing in the bars and central market in Santiago, disappeared, buried under snobbery. The resulting world could never again admit an artist and an intellectual of that type, frustrating them in advance, entombing them in barren housing developments, in perverse offers, reducing them to a subaltern body with which to trade any remaining dignity they might have. I think this goes some way to explaining the idea of the meadow and prosthesis, that perversity whereby our system creates misery in order to allow us to show how good we are by helping out the miserable wretches we have created. Everyone is familiar with the Minotaur, and to this day, if you get on a bus in Santiago, go to the Civil Registry, or worse still, end up at the police station, you can still see him there, the same as ever, lying in wait with the same infamous dilemmas: Which is more important, the flag or the coat of arms? JK: The labyrinth inhabited by the minotaur is a political one, defined by despotism and the corrupting influence of power. Yet in parallel, there is another, social, labyrinth in which the protagonist, Flaco, and his friends are trapped. The interaction between them makes for a fascinating commentary on the relationship between society and politics. I wonder if you could say something about how important this is in terms of the book’s structure and plot? RR: Fundamental. Without the labyrinth, the novel simply wouldn’t exist. It’s a sort of curved labyrinth, like they now say time is, one that spins on its own axis, where reality and fiction meet in a sort of grotesque supra-space. It’s a space in which what is credible works, one that houses reality and the grotesque, reality and comics, a coexistence in which the one justifies the other. They are essential, they need one another in order to exist, although they never share the same existence, despite being present at the same time in different dimensions. The challenge is to cross that labyrinth and one of the first tests for the reader is learning to read and decipher the messages in the press and the newspapers, their own obsessions. Perhaps when we reach the conclusion that this whole sideshow doesn’t matter in the slightest, perhaps that’s when we start to see outside. Strictly speaking, it’s a sort of alchemy: “Flaco” disappears; alchemists also disappear when they die. JK: Although the novel was published some years after the transition to democracy, it is clear that it had been a long time in the making. What was it like writing in that sort of political climate? RR: I started writing the novel in 1984. The earliest fragments date back to that year. I had finished it in 1992 but had to wait another two years before finding a publisher. One well-known publisher, after excellent reports, returned it to me one day with no explanation; in other words, the explanation was implicit. It spent another year with another publisher whose offices I eventually had to visit in person to ask for the manuscript back. Finally, it was the actor Pedro Vicuña, now involved in local politics, who took the risk of publishing it under his imprint Balandro Editores. I’ve thought about rewriting the text because, in spite of the apparent freedom of expression in the writing, I was nonetheless required to practise a sort of self-censorship. Many of the passages that might seem dark and obscure could now be made much clearer. That said, it’s also important for the novel to maintain the mark of the times in which it was written. JK: There is clearly a cathartic element to you writing the book. Do you see your novel as part of a larger literary attempt to come to terms with Chile’s troubled political legacy? RR: For me, the act of writing was cathartic in its own right, although it goes without saying that it can operate in the same way for the reader. In the words of the poet: hypocrite lecteur, mon semblable, mon frère. James Kelly is currently working on a full-length translation of A fuego eterno condenados as part of a Ph.D. in Translation Studies at the University of Edinburgh, due for completion in 2016. His translation of Malagueña is available to read online on The Radgeworks blog.